Heat a large Dutch oven with a bit of oil and fry off some braising steak that is cut into cubes. Fry about 5 minutes and then add a chopped onion and some chopped red pepper, sliced carrots, sliced mushrooms and sliced celery and fry for another 5 minutes until just softened. Sprinkle on some flour about 1 tablespoon, salt and pepper to taste. Chopped herbs of choice ( I used thyme and herbs de Provence). 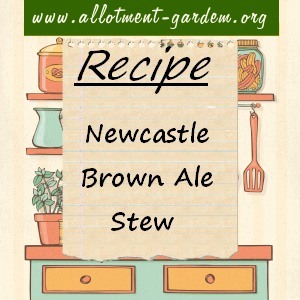 Add 1 cup beef broth and 1 cup Newcastle Brown ale. ( I think any ale or beer would work). Heat to boiling. Now I added about 4 to 5 rather thickly sliced potatoes to the top and then popped the lid on and into the oven for about 1 hour at 180C. Take lid off and let potatoes brown for about 20 minutes at 200C, or you can serve the stew with a side dish of new potatoes. I serve with a side salad of round lettuce leaves, chopped apples, walnuts or pecans and crumbled Stilton with a Caesar dressing.